Conchita Espinosa Conservatory of the Arts (CEC) is committed to developing and training young artists. Courses are designed to meet the needs and interests of students dedicated to furthering their natural artistic talents. Enrollment is open to the community and not limited to students from the Academy. Classes are also available for professionals and adults. Conservatory faculty is handpicked for their excellent teaching skills and superb reputation in their respective areas of expertise. The goal of each faculty member is to develop well-rounded artists in their students with excellent technique and a deep respect and love for the arts. The Conservatory Music Exam will now take place for ALL Conservatory music students from April 1 to April 11, 2019. Exams for Pre-A and Pre-B levels will take place during students' regular class time. All students in Level I and above will take their exam in the presence of a jury. The student's final grade depends on both the class grade reflected in their notebook and the jury's evaluation on the day of the exam. The exam will take the place of the student's regular music on that week. Parents are welcome to attend. Your child will be advised of his or her exam schedule. Exams should not interfere with any other Conservatory classes during this week. However, should there be a scheduling conflict, please advise the Conservatory office in order to make arrangements. To access the schedule of exams, please click here. Congratulations to the lovely dancers who participated in the Universal Ballet Competition in February! Congratulations to all who participated and to Danella Bedford and Kenia Garcia Cabrera for their love, dedication, and leadership! Enjoy a magical holiday evening of music and dance at the beautiful Banyan Bowl at Pinecrest Gardens featuring young artists from Conchita Espinosa Conservatory of the Arts. Christmas in the Gardens is a holiday spectacular that will include featuring cherished Christmas carols, a trip around the world with Navidades Flamencas, and The Snowman, an original story ballet that brings to life the beloved English story. On Saturday, November 3rd, the Conservatory celebrated Hispanidad 2018. This year's annual Hispanic Heritage performance, directed by Spanish dance department head Marisol Moreno, represented exactly what Conchita is about. The spirit of collaboration and mutual respect among our teachers and students was evident in the performance. Hispanidad 2018 was a collaboration among the Spanish dance, Music, Voice and Theatre departments, with every teacher involved bringing his or her style to the table, coming together to create an impressive evening of music and dance, performed exclusively with live music. Our sincerest gratitude and respect goes out to Marisol, and to all the teachers involved: Leiza Mendez and Cristina Masdueño (Spanish dance), Anaida Carquez and Edgar Sanfeliz (voice), Norman Milanes (clarinet), Jose A. Guibert (violin) and Alison Elliott (theatre). 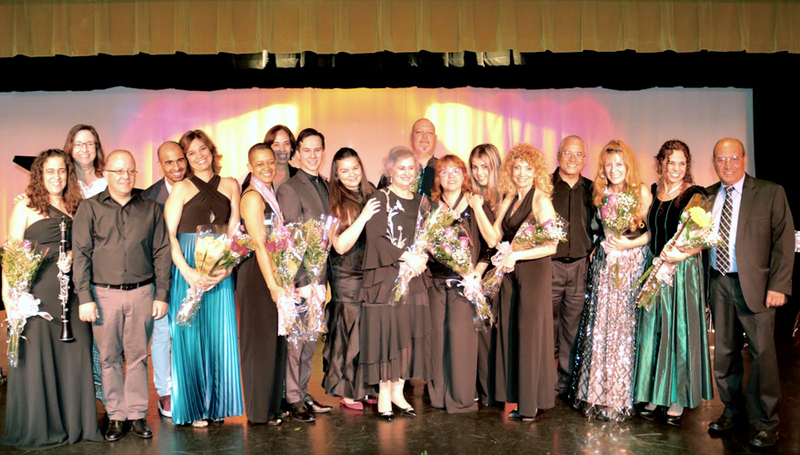 A most special thank you to our guest artists, Conservatory piano teacher Ileana Cortizo, who accompanied our dancers and musicians, as well as Walter Castro (cajón and cantaor) and Jesus "Sivi" Rodriguez (guitar). A group of performers shared the holiday spirit with the elderly community at Harmony Health Center Miami. They did a beautiful job sharing their talent and opening their hearts to those in need. They handed out tons of gifts from the Conservatory Re-Gifting Drive and then spent the afternoon chatting and playing games with the members of the Harmony community. Thank you to Maria Ofelia Armas for inspiring our students to share their gifts and open their hearts. The true meaning of Christmas is to give to those in need, and the best gift we can give is our time, our ears to listen, and our hearts to love. Thank you to all who attended and to our amazing Conservatory moms for their help and support!